The 2016 jury’s work is done! What a privilege it has been to work with such an exceptional group of people and to review such a phenomenal range of entries. The jury convened in New York City November 13-15. Interaction Awards co-chairs MJ Broadbent and Thomas Kueber did a masterful job preplanning the weekend. Our grateful thanks to host Liz Danzico and students of the SVA MFA Interaction Design program. On Saturday, the six jurors met in pairs to discuss the category shortlists. Their job was to evaluate how well each entry exemplified the category definition and met the evaluation criteria: How well did the team understand the audience and opportunity? How did they go about it? How well crafted was the final solution? What was its impact? Each pair of jurors proposed finalists and a winner in each category. The jury as a whole then reviewed these proposals, made some adjustments, and agreed on the final disposition of the awards. 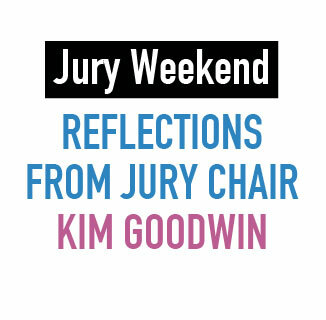 My role as jury chair was to assist during small group evaluations and then facilitate the larger conversation. Discussions were extended and vigorous at times, but they were always thoughtful and collegial. As juror Sudhir Sharma observed, everyone was open to “listen to a point of view and change their own.” A primary focus throughout was questioning whether interaction design was core to the entry. Jurors appreciated the diversity of the shortlisted entries, which tackled everything from daily inconveniences to major life challenges. Quite a few entries offered excellent storytelling—not to be confused with video production quality—which enhances their value as exemplars for the community. We struggled to assess some of the entries because they didn’t really address one or more of the evaluation criteria. Some entry videos showed people talking about the design, but spent very little time on the design itself. When entries used only static images or narrative description, the jury was less able to assess the interaction design because structure and flow matter. In the end, the jury recognized a broad range of projects across the six categories. Some push the boundaries of interaction design in interesting ways: for example, emphasizing interactions that are purely hardware or voice entry. Several finalists exemplify design as a force for positive change. Other finalist entries addressed relatively small, mundane problems with skill and grace. The jury agreed that these entries nailed some of the fundamentals at the core of our craft. Even small problems are worthy of our best efforts. The jurors are also delighted that you will see student projects holding their own among the professional entries. We felt the category winners best exemplified what each category is about; however, every finalist entry is strong work and worthy of recognition. Thanks to the jurors and co-chairs for all their efforts, to the IxDA community for all the work that went into peer review and, most of all, thanks to everyone who put their work out there. The community benefits from seeing the range, diversity and thoughtfulness evident in interaction design today. Stay tuned: the 2016 finalists will be announced shortly!